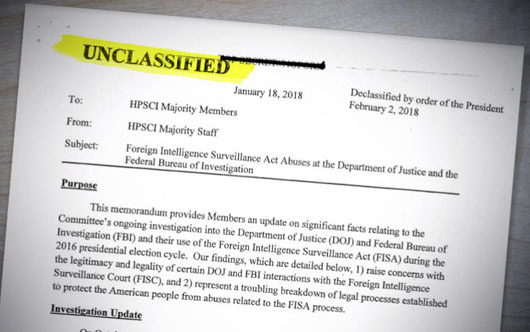 Here is the main takeaway from document: The FBI relied heavily on the discredited Trump “dossier” by ex-British spy Christopher Steele to obtain FISA warrants to spy on Trump campaign associates. The dossier has been revealed to be a political opposition research report by the Clinton campaign and the DNC that was presented in the FISA applications by the FBI as a counterintelligence document. When these machinations came to light, FBI officials urged President Donald Trump not to release the memo. “They didn’t have enough of anything to get a FISA warrant to surveil and spy on the Trump campaign, the Trump transition, Carter Page, Trump Tower, you name it. Without the Steele dossier, which has never been corroborated, none of it has been confirmed, none of it is true, all of it written and created by the Hillary Clinton campaign using Fusion GPS. “DOJ and FBI officials … knew everything I have just told you. They knew everything but excluded that [background] when they sought the FISA warrant. “The FBI’s top leadership – whose careers, business dealings, politics, marriages and extramarital affairs intertwine – invested itself incompetently and illegally into the 2016 election campaign against Donald Trump. In part to cover itself, it launched the so-called ‘Russia probe.’ Its members are personally, deeply interested in keeping the public from seeing the documents concerning these activities. They raised the familiar shield: release would compromise the sources and methods of national security. “The House of Representatives’ Republican majority wanted the documents made public, issued a subpoena for them, and was prepared to jail senior FBI for contempt had they not complied with it. The House compromised, being satisfied by viewing them and making a summary, which it has voted to make public. The FBI and the Justice Department’s bureaucracy, being out of options for saving their reputations, their pensions, and perhaps for keeping themselves out of jail, urge President Trump to advise the House to guard the secrecy of the summary, of the activities that it describes, and hence to save their bacon. “The Democratic Party pretends to care so much about national security, to have such faith in the FBI’s stewardship of it, and such diffidence of the American people’s capacity to judge such matters, that its leading spokesmen have joined the agencies’ demand on Trump. “This is as rich constitutionally as it is politically. The Agencies, having told the country and President Trump for a year that they are the arbiters of secrecy, scurry to get back under the presidency’s protective power by asserting that this power extends over Congress as well. “Sorry, fellas, it does not. No president can tell Congress what to tell or not to tell the American people, or not to subpoena your documents, or not to put you in jail if you don’t comply. Maybe if you had not slapped your lawful boss around with your pretense of “independence,” if you had come to him confessing your sins and humbly asking his indulgence, you might not be in this fix. Now you are asking for a “get out of jail” card, which he probably can’t give you even if he wanted to. “The reason is political. Despite your, the Democratic Party’s, and the media’s dogged efforts to deep-six the facts concerning your misdeeds, nothing is going to put these black cats back into the proverbial bag. They are coming to light through the whistle-blowers among you, working with journalists on the media’s periphery, and with substantial Republican elements. At this point, the more you protest ‘National Security,’ the fewer people believe you and the more you anger.